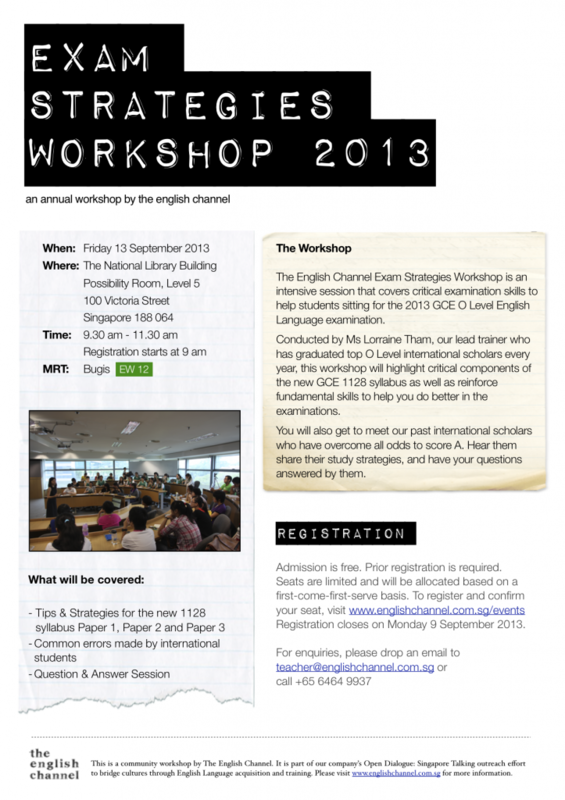 The ‘O’ Level English Exam Strategies Workshop is back! 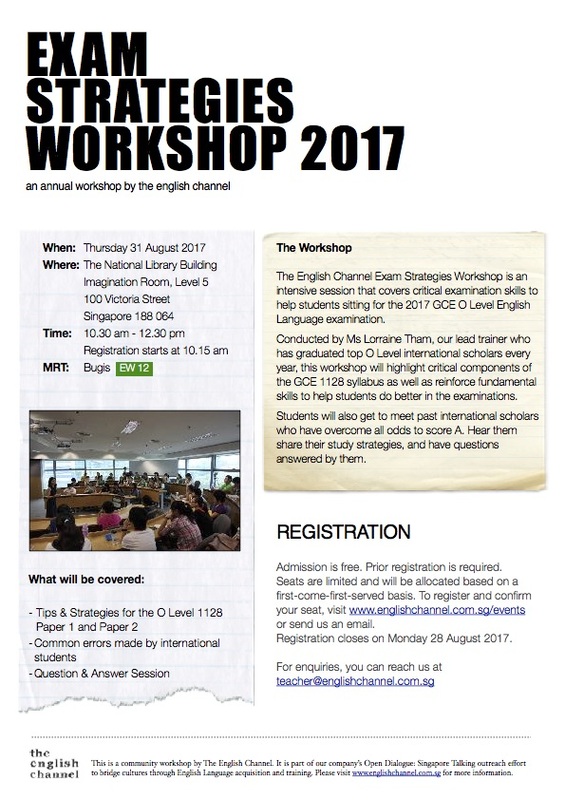 The workshop is an intensive session that covers critical examination skills to help students sitting for the 2017 GCE O Level English Language examination. We will be covering strategies and effective ways to improve your grade for the English Language paper. Learn how to maximise your marks and avoid common errors for Paper 1 Writing and Paper 2 Comprehension. If you have any burning questions you want addressed during the workshop, do send them in together with your registration form. Register early because seats are limited and allocated on a first-come-first-served basis. Don’t miss this rare opportunity to hear seniors share their own success stories and have Ms Tham answer all your questions! To register, complete the registration form here. Registration closes on Monday 28 August 2017. For enquiries, send an email to teacher@englishchannel.com.sg or call 6728 3590. Ms Tham sharing tips and strategies with attentive students. 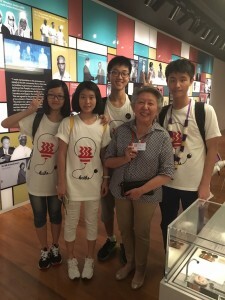 Ms Tham and the guest speakers, Yang Hui and Tianshu. We hope you walked away with useful tips and strategies that you can use to improve your exam score. Ms Tham is very hopeful that there are quite a number of potential A1s amongst you, so remember to apply everything you have learned and come back in 2014 to share your success stories with your juniors. Remember to let us know your grades! The workshop was a full house! For those of you who are taking on the Weekly A1 Challenge posed by Ms Tham, remember to email your responses to teacher@englishchannel.com.sg Ms Tham will select the best attempts for each week’s challenge and shortlist student submissions for A1 makeovers and error analysis. Don’t miss out on the opportunity to learn how to improve your work! 1. Do you think teenagers should work during their school vacation? 2. ‘Recycling is a waste of time.’ What are your views? Email your response by Friday 20th September 2013! The challenge will be revealed on Saturday 21st September. So check in here for details. Our annual Exam Strategies Workshop is back! This year, we will be covering strategies and effective ways of scoring for the new 1128 English Language paper. 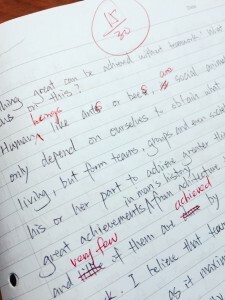 Learn how to maximise your marks and avoid common errors for Paper 1 Writing, Paper 2 Comprehension and Paper 3 Listening. If you have any burning questions you want addressed during the workshop, do send them in together with your registration form. Register early because seats are limited and allocated on a first-come-first-serve basis. Don’t miss this rare opportunity to hear a panel of seniors share their own success stories and have Ms Tham answer all your questions! The English Channel (TEC) is partnering Speak Good English Movement (SGEM) 2012 for the first time this year to help further the movement’s cause of encouraging better communication through the English language. TEC will conduct a series of workshops focused on the main components of the O Level English examination, including essay writing, reading comprehension and spoken English. In conjunction with the launch of SGEM 2012, TEC will start off with a workshop for 200 underprivileged students from community organisations such as SINDA and Mendaki. Commenting on the importance of helping students for the O Level English exams, Ms Lorraine Tham, founder of The English Channel said, “The O Level English exam is the final key assessment for students before they move on to tertiary education. How well they perform affects their confidence and interest in using the language beyond their studies. Helping students do well in their O Level English exam gives them the confidence to use the language in their everyday lives, and the more they use the language, the better they will get at it”. The first of a series of 2-hour workshops will be held on Saturday 29th September 2012 at Queenstown Public Library. Each workshop will accommodate 200 students. It will comprise of a 45-minute lecture, a 45-minute hands-on session and a 30-minute Q&A. Thank you for attending the Exam Strategies Workshop 2012 last week. We hope you found it useful in your preparations for the examination. Here’s another resource – the narrative essay “Space” by Pan Yuanzhen – which one of the guest speakers at last week’s Exam Strategies Workshop 2012 has kindly allowed us to share with all of you. Download the essay by clicking below. We will be adding new resources once every fortnight. So do check this website for more resources. Thank you for attending the ESW2012, we hope you walked away with plenty of useful tips and strategies to tackle that English paper! We would like to say a big thank you to our guest speakers Yuan Zhen and Ang Di for taking time to come back and share their journey to A1. They have also generously consented to share more of their essays and vocabulary journal with us so do check our resources section for updates. The Exam Strategy Workshop will be back next year. Please share this workshop with your juniors if you have found it useful. Who knows, we may see you back here next year sharing your own journey to A1! Registration for Exam Strategies Workshop 2012 is full! New session added at 8am. The number of students who registered for the Exam Strategies Workshop 2012 on Wed 5 September at 10am has exceeded the capacity of the seminar room! As Ms Tham is unwilling to turn away any student who is eager to learn, we have decided to open up a second session at 8am on the same day. Students who have been sent confirmation via email to attend the 8am session, please be punctual as the lecture will start at 8am sharp. Exam Strategies Workshop 2012 is back! 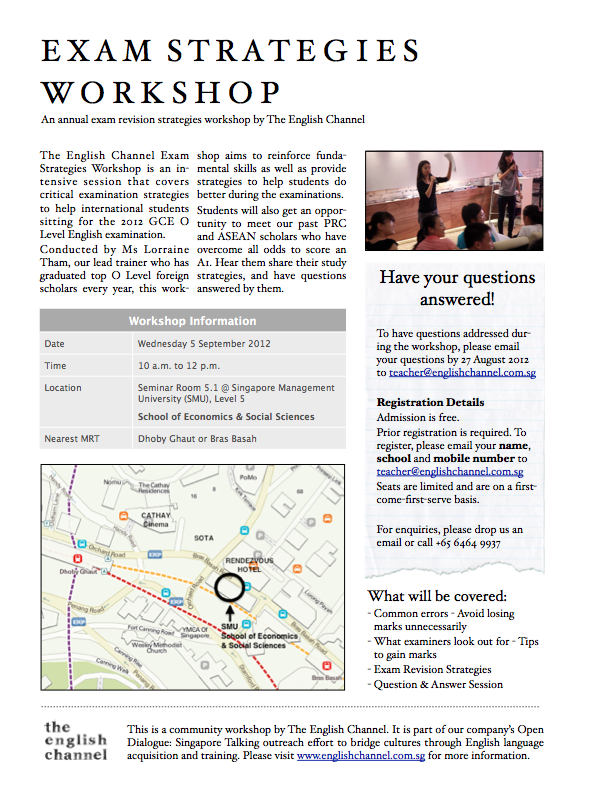 With the O Level English examination barely two months away, our annual English Channel Exam Strategies Workshop is back! 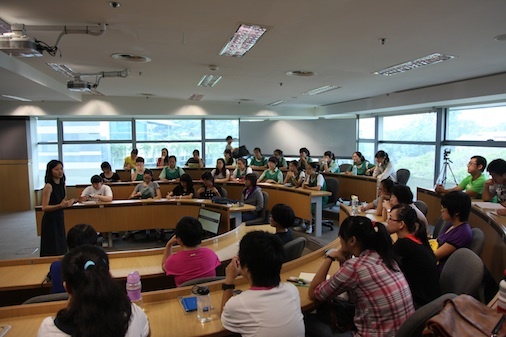 It is an intensive session that covers critical examination strategies to help international students sitting for the 2012 GCE O Level English examination. Packed with tips and strategies to help students prepare for the big day, the workshop will cover key strategies to score extra marks, common errors to avoid losing those precious marks, as well as tips on what examiners look out for in your scripts. Cost: Admission is free, but prior registration is required. Email your name, school and mobile number to teacher@englishchannel.com.sg to register. Seats this year are very limited, so sign up early to avoid disappointment. Are you worried about your English exam? Are you studying the right way for your English exam? Do you want to learn how PRC scholars score an A1? Don’t miss out. Call 9760 0067 or email us at teacher@englishchannel.com.sg to find out more. Registration Details: Please register via email teacher@englishchannel.com.sg or SMS 9760 0067 if you are keen to attend this 3-day course before 4 August 2012.